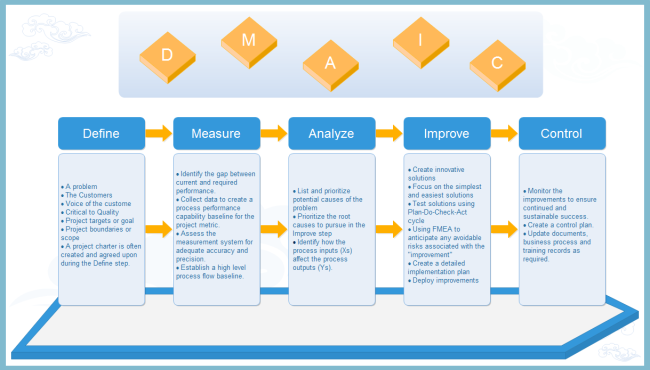 Learn about DMAIC basics from knowing its definition, purpose, and effective tools. Gain free and good-looking DMAIC designing templates. People all come across problems within the working environment. Something needs to change, something's wrong, and needs to be fixed, and they are faced with the challenge of improving the efficiency and productivity of their businesses. To do this, they need to understand the best methodology and tools to study and analyze processes correctly. DMAIC can be an iterative process that gives structure and guidance to improving processes and productivity in the workplace. DMAIC, which is short for define, measure, analyze, improve, and control, is an approach to problem solving, aiming at helping you better understand the process and provide you with insight you can use to easily apply the methodology to an existing problem within your organization. Define: This is the first and the most critical step of the Six Sigma DMAIC methodology which requires defining the process and its objectives. The purpose of this step is to clearly articulate the business problem, goal, potential resources, project scope and high-level project timeline. In this phase, the leaders of the project create a Project Charter, create a high-level view of the process, and begin to understand the needs of the customers of the process. Measure: Measure step involves the use of various statistical and technical measurements with accurate metrics, to analyze the effectiveness of the existing process. It helps the Six Sigma team members to analyze the performance level of the existing process and its deviation from the actual requirements. In this part you decide what parameters need to be quantified, work out the best way to measure them, collect the necessary data, and carry out the measurements by experiment. Analyze: The main objective of this stage is to reveal the root cause of business inefficiencies. Too often when trying to solve a problem, people or teams tend to focus on a symptom as opposed to the true root cause of the problem. Through this step, you identify gaps between actual and goal performance, determine causes of those gaps, determine how process inputs affect outputs, and rank improvement opportunities. Improve: Once the project teams are satisfied with their data and determined that additional analysis will not add to their understanding of the problem, it's time to use what they'e learned about the process to be innovative when solving the problem at hand. The purpose of this step is to identify, test and implement a solution to the problem; in part or in whole. Identify creative solutions to eliminate the key root causes in order to fix and prevent process problems. Control: The real strength of the DMAIC steps is the Control step. After the analysis of the problem, the team finds the solution for the existing problems and refines the existing process. In this step, you generate a detailed solution monitoring plan, observe implemented improvements for success, update plan records on a regular basis, and maintain a workable employee training routine. Edraw is an all-in-one visualization software containing flexible tools for different needs. Besides DMAIC diagram, Edraw also provides solutions for SIPOC diagram, Cause-Effect Diagram, Value Stream Mapping, Brainstorming, QFD, Affinity Diagram, Scatter Plot, RACI matrix, PDCA cycle, and much more to help finish your six sigma. Among the best diagramming tools available, this software is perfect for experienced diagram designers or those who are just getting started.